My busy but lucky schedule this fall included a workshop in Manhattan Beach, California. So, I decided to extend my visit West for a few days afterwards and enjoy some time relaxing on the beach. Cali is true surf country, and at any time of day I could watch bodysuited surfers practice their sport. Ears and eyes open (Wayfarers on), I learned not only a lot about successful surfing, but also a lot about what I need to do for my own success, too. With apologies to you surfing passionistas* out there, here are three things I learned. 1. Don’t be afraid to bail. It’s better than wiping out. It seemed to me that if you want to surf, you get up on the board and stay with the wave until the very end. At least, that’s what it’s always looked like on TV. But watching my real-life 90210ers, I noticed that the best surfers—the ones who rode a wave the longest—actually would bail on a ride before it had fully wound down. In other words, they’d intentionally jump off their board as they sensed the power of the wave lessening, rather than waiting to fall off when the surf could no longer hold them up. That’s pretty brave—and smart, too, especially compared to the surfers who didn’t bail (surfboard headache, anyone?). These surfers could tell from their experience that they’d gone as far as they could go on this particular ride. They knew that taking control and creating their own ending to the ride was more predictable–and probably safer–than waiting to fall. I started thinking about the work waves I’m riding. Which are about to fizzle out, compared to others that are at high tide? Where do I need to bail? I thought about my clients, too, many who are in jobs or working on projects where they’re wondering if there’s momentum left or whether they need to hop off and catch the next wave. It was a good reminder that bailing for the right reasons—experience, intuition, data—can be a very powerful action to take. 2. You don’t have to surf every wave. Be patient for yours. One of the things a quiet beach weekend gives me is the ability to hear my own whispers again, to remember what I want, what I care about, and what I want most from my work and life. Once I hear me again, then I start to get impatient. Where ARE you, my brain screams at the almost-there idea, the just-blooming connection. But the surfers showed me that you just had to wait. And wait. And your wave will come. Even though there were a lot of waves hitting the shore, not every one was right for every person. One dude (yes, he was) sat astride his board, carefully watching and waiting for just the wave he wanted. I’m sure he had the list in his head (or gut) of what he was looking for, and sure enough, when he ID’d it, he’d paddle madly across the water and pop up on his board just when the ripple became surf. His patience paid off. The waves I want always come. I just have to practice being patient—and then be ready to paddle like crazy when it’s here. 3. You’ll know when you’re done. 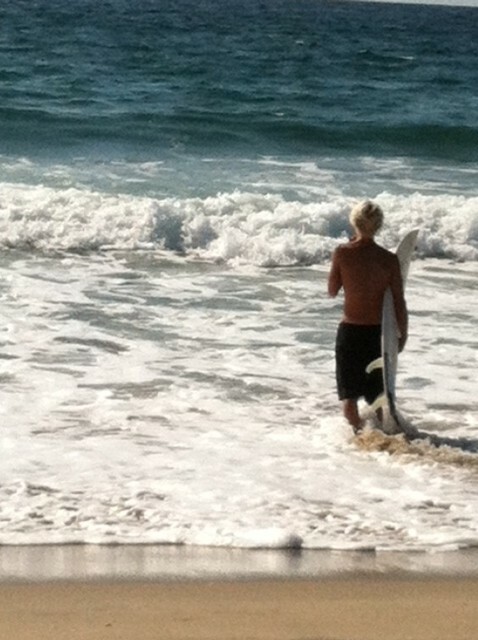 “Toast,” cried the extremely blond 20-something as he plodded through the shallows back to the shore. Since we weren’t sitting down to breakfast, I took his slang-xclamation to mean that he was done for the day. The waves were still strong and beckoning, but my guess is by the way he unpeeled his torso from its nylon constraints and threw himself on the sand to rest, he felt he’d done enough. When’s the last time you knew you were done—with the project, the conversation, the day? It gets hard for many of us to know, since our waves of work never seem to stop. But we can’t surf them all the time, or else we risk exhausting ourselves and wiping out in more dramatic and painful ways. And with that, this post is toast. YOUR TURN: What secrets have you learned from others just by watching? Share them with us by replying below or posting on our Facebook page, or tweeting it out on Twitter! You don’t have to do this alone! Happy the tree was a lesson and not more trouble. Now I’m looking forward to my Laguna Beach trip in a couple of weeks. I’m going to make sure I have some time to listen to my whispers.